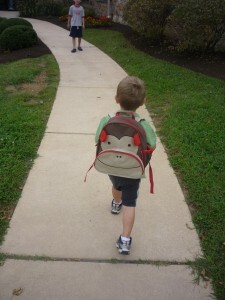 There wasn’t anything cuter earlier this week than the sight of my first time preschooler walking into his new school for his first day with a Skip Hop Monkey Zoo Pack on his back. There’s a write-on tag inside so you can mark it with their name, a front pocket for little extras and ample room for any preschool needs like extra pull ups, art work, spare set of clothes. At $20, these bags are BPA-free, Phthalate-free, PVC free. Get it on Amazon, in-store at Target or Toys R Us or direct from Skip Hop. I got my 4 year old the mouse backpack from Skip Hop and she loves it. It truly is just the right size, carries a good amount of “stuff” and seems to be pretty durable.